This chapter investigates the use of social media, and specifically Facebook, by local sustainability groups. 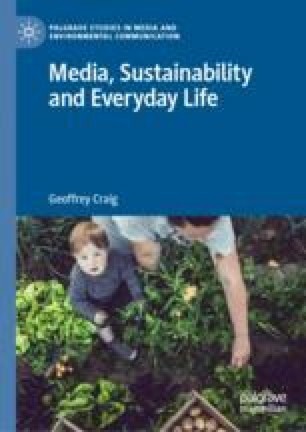 The chapter firstly discusses the concept of ecological citizenship and considers the character of the environmental activism of local sustainability groups that focus on everyday sustainability. It also outlines particular understandings of the ‘local’ and the ‘community’ in everyday sustainability. The role of Facebook in identity formation and community engagement is discussed before an analysis of Facebook usage by four different local sustainability groups that reveals a strong involvement by females in the groups, a focus on the group’s local community with less orientation to global environmental perspectives, and the importance of Facebook as sites of emotional engagement and support. Christensen, Henrik Serup. 2011. “Political Activities on the Internet: Slacktivism or Political Participation by Other Means?” First Monday 16 (2). http://uncommonculture.org/ojs/index.php/fm/article/view/3336. Statista. 2018. “Number of Monthly Active Facebook Users Worldwide as of 4th Quarter 2017 (in millions).” https://www.statista.com/statistics/264810/number-of-monthly-active-facebook-users-worldwide/.